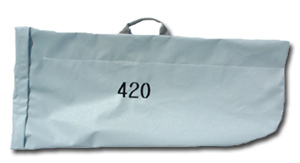 420 Rudder-Tiller Cover - Napbac -- One Design Sailboat Covers -- The Sailors Tailor, Inc.
A great way to protect your rudder and tiller while storing or transporting to and from the lake. This one piece bag has two pockets - one for the rudder and another for the tiller. Velcro closure, handle, and 420 monogram make for a very attractive addition to your covers. Oops! We Monogrammed the wrong Sail number on a brand new 420 Rudder Tiller Bag. If you do not mind having USA 16210 on your bag, we would be happy to offer this cover for $10.00 off. Never used brand new bag. Click Here for more info on this special savings cover.